Like its larger sibling, this elevated planter box is distinguised by its craftsmanship and is only available at Gardener's Supply. With a nod to Mission-style furniture, and compact enough for a deck or patio, it can hold a stunning variety of vegetables, herbs, and flowers. Use our free Kitchen Garden Planner tool to create your custom plan, or try one of ours for inspiration! Excellent as a starter or small-scale kitchen garden; grow vining or heavily fruiting plants with the support of the optional 3' CedarLast Trellis, sold seprately. Let your planter box age naturally, or protect it with food-safe Clear Waterproofer. 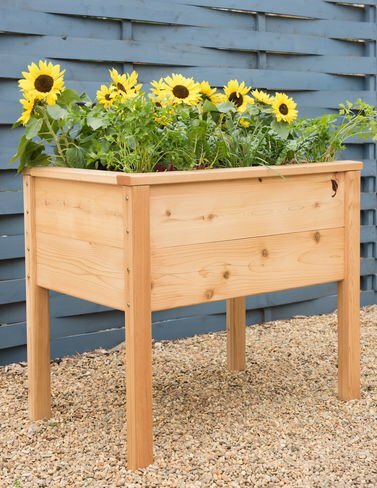 With a nod to Mission-style furniture, and compact enough for a deck or patio, it can hold a stunning variety of vegetables, herbs, and flowers.